Ridmark Arban is the Gray Knight, leading the defense of Andomhaim from the brutal Frostborn. Yet the realm of Andomhaim is riven with civil war. The false king Tarrabus has usurped the crown in the name of the shadow of Incariel, and the loyal lords must fight the ruthless rebels. Unless Ridmark can defeat Tarrabus and reunify Andomhaim, the Frostborn will prevail. A great plup fantasy read. The best of the Frotborn series so far. A novel with a lot going on, even a tiny bit of Lovecraft. WOW. what a book. The best yet, these books keep getting better and better. As for the ending what a cliffhanger and now have to wait till summer. If you enjoy reading these type of books, then you will really enjoy reading this series. 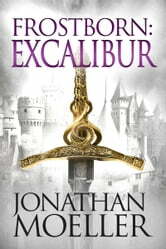 I feel like I'm on this quest with Ridmark and his companions, so now I will be starting the next book in this series. I hope that Ridmark will marry the person in which I have been championning for from the very beginning . Mr. Moeller, is a masterful storyteller. This series keeps you spellbound, and wanting to keep turning those pages. I read through the books in this series at lightning speed. My favorite part of this book, was when Tarrabus Corbane, "channeled" Han Solo, stating that everything that happened to him, was NOT his fault.